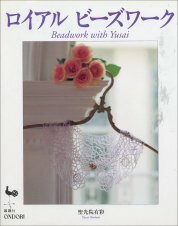 An Ondori publication this book has several small beaded flower projects as well as lace bead work collars and 19th century style knitted purses and bags. More photos. Sign up for the mailing list to be notified when new stock arrives. "Beads Book" volume 2, is an 8-1/2 x 10-1/4 inch softcover book with 97 pages. There is very little English, with only a few words here and there. The photography is excellent and there are some of the best diagrammed patterns I’ve seen. 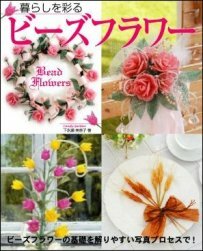 There’s an eight page section on beaded flowers including detailed Lavendar and African Violet instructions. There is also a half page devoted to the Swarovski Cxrystal flowers which were featured in the August 19 newsletter. There are photos of the flowers by Dalene Kelly, Judy Heller, Roe Topol, Elaine Cobb and Caren Cohen (me). 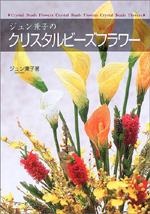 Originally in Japanese, this book in now in English. The diagrams are easy to follow, the photos are stunning and the instructions show how the various arrangements are put together. I especially love the wreaths in this book. 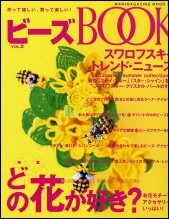 View Candy's stunning beaded flowers at her website which was featured in the September 1, 2003 newsletter. This book is pure eye candy and I can't help but look at the pictures over and over and over! Written by the author of several now out of print beaded flower books this one includes instructions although not for every photo. The Calla Lilies on the cover show superb use of shading and although instructions for this flower are not in the book there are plenty of Calla Lily patterns available and the cover photo is so clear that you could easily mimic the shading. Many other flowers in this book do include specific instructions for shading. 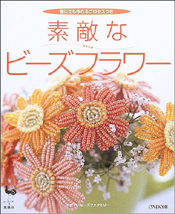 Filled with beautiful arrangements of small to medium flowers this Japanese language books has very clear diagrams of many French-Beaded flower techniques.